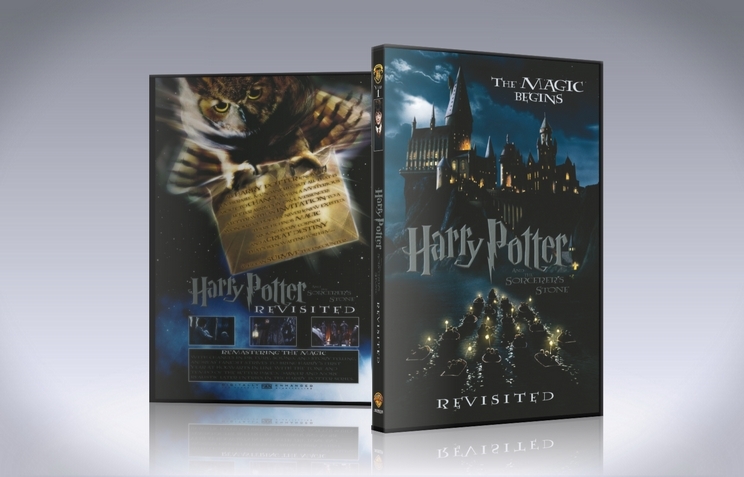 To make a film that was not only better paced and more interesting to watch, but also a film that echoed the visual style and tone of the later entries in the Harry Potter franchise. New sound effects | New music | New color palettes | New pacing | New approach ... and a deep, deep passion. - Entire movie is color corrected to fit the visual tone of the rest of the series. All bright and golden colors are now absent and color palette replaced with a slight blue/green-darker one resembling that of Prisoner of Azkaban and Goblet of Fire. - Much of the movie is re-scored and integrated with new sound effects. - The entire opening is re-imagined and re-made to set a new tone and develop a more engaging story. Why start the movie with magic if the magic is not yet explored? We follow the eyes of Harry here. - A flashback-sequence to Grimmold's Place is incorporated as a nightmare to which Harry wakes up to (can be seen in the opening sequence up above). - Trimmed Dudley & Harry "going to the zoo" sequence in the stairs simply for pacing; Dudley doesn't run down the stairs and then back up again before starting to jump. - Soundtrack added to Harry & Vernon "Any funny business, any at all.." outside the car. This sets the tone for how Harry really feel in the company of the Dursleys and also how the audience should feel. He has been, and is being, treated poorly and this never comes across like i feel it should. Now I've changed that. It comes across through an emotional, yet very subtle soundtrack from Half-Blood Prince during one of Harry & Dumbledore's last conversations ("I can still see the small boy from the cupboard.."). This is also to strengthen that scene when it shows up five movies from now. - New soundtrack and sfx added to Zoo-Snake sequence, as well as a new glasswindow effect. This is the first time we see Harry use magic and to me it felt like it should be a gamechanger. Now it comes across like that in a very thematic way. - "There's no such thing as magic"-sequence is altered with music, tone and sfx. - SFX added when Owls gather outside Private Drive. - "The Hut in the Ocean" has been heavily altered, scene by scene, with a new color palette. New SFX at slow or bad parts as well. - A subtle, but emotionally powerful soundtrack is playing when Harry is given his birthday cake from Hagrid. This is the beginning of a great friendship, and the first time ever that Harry gets a gift given to him. It's actually a strong scene. - Hutscene altered with sfx, music, effects and toneset. As Harry's past is slowly revealed to him by Hagrid the tone develops properly with it. This scene is strictly beautiful now and very emotional. - Harry leaving his old world behind and deciding to go with Hagrid has been altered with a new and beautiful soundtrack. This scene should'nt just be a gamechanger, it should feel like it. Also new background SFX due to audio alterations. - Harry & Hagrid on train to London was reincorporated into the movie from Deleted Scenes. Removed it again due to pacing, and the fact that the dragon subplot is completely removed from this fanedit. 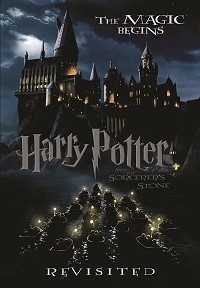 - The Leaky Cauldron/The Inn is better paced and much more amusing and thematic. One of the many problems of the theatrical was it's poor cinematography and tone in all the quiet places. - All overlong shots of both the Inn, Diagon Alley, Ollivander's Wandshop, Gryffindor Common room, The Great Hall etc have been altered and trimmed. There are some many weird, long shots in this movie. This is finally fixed upon now and helps give the movie a better-paced feel as we explore the world of Harry Potter. - Gringotts introduction sequence altered with completely new music and sound effects, including a minor part of the old for nostalgia. - Gringotts underworld scenes have been altered with sinister music. The theatrical score is too much on an upbeat opposite the color and tone set in this re-visitation, and therefore many such changes are necessary. - The reveal of Harry's vault now has an overwhelming, exploding kinda feel to it. New SFX. We should all be 'Holy shee-' at this reveal. Now we feel it in our guts. - The Sorcerer's Stone is now glooming slightly red from underneath the paper to make the object more significant and also give Harry's assumptions about "the object Hagrid took from vault 713" more meaning. - Olivander's wandshop is altered. This sequence, as Diagon Alley, has been re-colored throughly. A very important scene, maybe the most important and impactful scene of the series. - Olivander's Wandshop sequence has been changed. Harry now tries one more extra wand (3 in total) instead of 2 (theatrical). There is also traces of upcoming thematic themes, such as Voldemort's theme (from both GoF and DH) and Secrets of the Castle. All very subtle, but enough to help create the series thematic narrative. It's also much tighter edited for pacing. - Harry touching his wand (we are all thinking it..) for the first time is now accompanied by a bass. - Hagrid telling about Lord Voldemort is altered. Flashback-sequence heavily altered with a complete, new sfx and soundtrack as well as much new footage. And, of course, stars Harry's father which I deem crucial! - Harry & Hagrid "What happened to Voldemort?" - "I reckon he's still out there..," is removed. It is a big cliché and a big mistake to let the audience know the antagonist's fate this early on. It is ment to build suspense, but what it does is always to diminish it. The audience knowing nothing about Lord Voldemort's whereabouts, mostly assuming he's dead or gone for the movie, will give the reveal of his existence so much more impact and be so much more sinister. - Professor Quirell and Harry's handshake moment is removed. They meet, they say goodbye. The whole "not that you need it, eh, P-p-otter," was poorly executed and therefore very awkward. Also, a soundtrack is slighty added and altered to the scene to make the entire Inn (and subconsciously Quirell both) feel suspicious to the audience. Not anything obvious of course that would diminish the entire plot twist of the movie, just give it more sense. - Diagon Alley entrance re-scored with both music and sound effects. The brickwall opening a gateway to something Harry did not yet know of should be as intimidating as exciting, therefore the change. I still want the audience to feel what Harry feels as well as to keep track with the overall thematic tone of the movie now set, which is now grittier, yet still exploratory and wonderful. - Diagon Alley completely re-colored, almost scene by scene. The original had so many colors and awkward blooms I had to pick them off one by one. - Apparition-sound added a few seconds after Hagrid leaves screen at King's Cross "hold on to ya'r ticket, 'arry". - Entrance to Platform 9 3/4 sequence is altered. - Trainsequence is altered and trimmed. These sequences are simply too long and we are on overdue. No candyeating! - Hermione introduction altered. A slight comedic soundtrack added. Harry & Ron are literally thinking "this girl is crazily high on herself", and she is, so let's play with the audiences feelings a little more. It gives her introduction more power. - First "Inside the Castle" is altered with new music at one part. - Neville losing his toad and interrupting McGonagall is removed. - Draco Malfoy introduction removed. It felt forced. These boys should not be rivals by some straight-forward dialog literally saying "chose the dark or light side, harry, and if light, we're not friends," but rather by showing it. The good ol' show, do not tell approach always wins as it does not take the audience for a fool. - Draco Malfoy being chosen to Slytherin house is altered, so is the introduction to Snape, and Harry's burning scar. Much more impactful scenes now. - Impact SFX added when the Sorting Hat is placed on Harry. - "John Cleese" and Ghosts floating around The Great Hall is all removed. Bad CGI, unecessary drag and it's time to get this movie's plot started already. I had it in for some time with certain alterations to the ghosts to make them look more natural, but in the end It felt right to remove this sequence. - Harry looking at the nightsky in the Common Room with Hedwig by his side, beautiful as this scene is from beforehand, now also has "A window to the past" playing before transitioning over to the original Harry's theme. Two big soundtracks that in many ways define Harry's growth, and what he feels deep inside. - Potion sequence deleted. Reasons are stated on Page 11. - Voldemort's theme added when the 3 friends read the Daily Prophet about the Gringotts robbery. - New transition shot added. - Courtyard Broomstick Practice with Madam Hooch is heavily altered. - Harry meeting Oliver Wood, accompanied by McGonagall, is better paced and altered with a soundtrack. - Sinister music ("Dumbledore's Speech") added when the 3 friends are traveling through Hogwarts at night, before visiting the third floor. - The Third floor heavily altered. The reveal of the Three-Headed-Dog much more impactful. The animal looks more natural now than CGI-heavy. Keyframed and edited. - The 3 friends discussing the dog and what just transpired, is altered. New sfx, new music and overall much of a more menacing and worrying scene. - New transition shot when "The Troll" is revealed to be lurking in the dungeons and the Prefects take the students to their Common Room. - SFX added when Harry & Ron see the Troll. - Some new SFX added for the troll. - Removed some of the dumb and unecessary "hammer-dodging" from Harry while grabbed by the troll. - Hermione doesn't dumb up and yell "Swish and Flick!". - New soundtrack added for when the teachers arrive. - Suspicious music for when Harry sees Snape's leg. - A subtle Voldemort's Theme added at "Last night, I'm guessing Snape let the dog in as a diversion". - Quidditch Match heavily color corrected. - Some musical bits have been altered and replaced with the Quidditch Match soundtrack from the third movie. - Quidditch Match much better paced. - New Christmas Theme and SFX in the transition shot. - The Invisibility Cloak :: new soundtrack to create a connection with the Deathly Hallows. - The Forbidden Section in the Library :: altered. - SFX added to Door being opened and closed when Harry enters the room to the Mirror of Erised. - New soundtrack added to that sequence. - Removed Ron's introduction to the mirror. Destroyed the emotional pace I wanted for these sequences. - New SFX and soundtrack added to the second time Harry visits the mirror. - New SFX and soundtrack for the transition shot to Spring. Strictly beautiful. - "Visiting Hagrid's hut". Dragon and it's subplot is removed. - When the three friends see Malfoy, they panic and go back to the castle. It's all better paced. - Next scene, in the castle, prolonged with one second as we need a slower transition between these two scenes. The bird now beeps twice before camera pans, though the background is keyframed to behave as if no change was made. - Completely new SFX and soundtrack added to Filtch escorting the kids to Hagrid's hut for their punishment. It's pretty darn scary now. - The Forbidden Forest heavily altered. - The Unicorn now groans in pain as Harry and Draco see Voldemort drinking blood from it. - The encounter with Voldemort altered. Very scary now. Parseltoungue can also be heard as Harry touches his scar. - Voldemort's sharkteeth are removed. He doesn't have those later on in the movie or series, so let's friggin remove it. Looked ridiciolous. - Voldemort doesn't growl like a beast because he isn't one. - Voldemort can be heard saying "Kill him!" to Quirell as Harry looks away. Creates a more realistic dynamic between Quirell and Voldemort, and also builds meaning to the fact that there are actually two persons there underneath the dark hood, not just one. Gives the Two-Headed reveal more meaning at the end. - The Unicorn saving Harry ("Florence") is altered. He comes faster into the frame and out of it, to show Voldemort's escape as quicker and more realistic to the audience. It looked very staged in the original. - The 3 Friends discussing Voldemort's apperance in the Forbidden Forest is altered. - Removed the 3 Friends visiting Hagrid and Hagrid being dumbed-down for like the fifth time throughout the original movie and tell them everything they need to know. This subplot isn't even really needed for the movie to work. - Removed scene with Snape (this is saddening, but the scene was pretty bad and it completely destroyed the pace I was looking for). - Neville confronts the friends. Music altered. - The 3 Friends walk down to the Third floor. Music altered. - Harp is already playing. We didn't need the dumbed-down Hagrid flute subplot for this to have an affect. - Devil's Snare sequence heavily altered. Much, much more intense. - New music to the Flying Keys-challenge. - Not a new change, but worth noting; No changes were made, except for color and some minor SFX changes, to the Key-and Chesschallenges. They worked pretty good as they were made for the original, and held up well with the tone and suspense built throughout this edit. - Harry & Hermione's theme from Half-Blood Prince added when they talk together before Harry's last task. - Voldemort's Theme added throughout Voldemort Confrontation. - Some of Quirell's overly explanatory dialogue is removed. We're not idiots, and some of it isn't even needed to be told. - SFX added when Voldemort speak for the first time from underneath the turban. - A gut-wrenching flashback sequence is added to when Voldemort's face is revealed. I love this sequence so much, and it has been nitpicked for a long, long time! I feel it's length and sole purpose is perfect now! - SFX added to when Harry says 'Voldemort'. Now we know. Our fears have come true. - Lily's theme sublty added to when Harry sees his parents in the mirrory flames. - Ending completely re-arranged. It's heartwrenching. Flashback sequences added. This is my definite favourite peak of this fanedit! Have a tissue nearby! When I first heard you were attempting to bring the tone of the film more in line with the others in the series I had mixed feelings about it. On the one hand, Philosopher’s Stone is my 2nd least favorite movie, but I was worried that you might possibly go too far in the attempt to darken the movie. I’m glad to say that my fears were completely unfounded. This is quite a brilliant edit, and though it has it’s problems, it’s so well done that those complaints don’t amount to much. Reworking the first few scenes of the film was an inspired choice and it works really well in changing the tone of the film. I also really loved the insertion of exterior shots from later movies in order to help make the changes between the 2nd and 3rd film less jarring. The musical score changes and additions are welcome. Most of the time it’s done seamlessly enough that if I hadn’t seen the movie over a hundred times (not exaggerating here) I wouldn’t have noticed. That being said there were a few sections where I could hear the original track underneath the new music, and several times the new music would only play for a few seconds before disappearing which left me confused as to why the soundtrack changed there. The only music choice that I felt was bad was when they see Hogwarts from the boats. Mostly because the tone of the music doesn’t gel with the visuals at all. The school is lit up all nice and warm and you can see the smiles of joy and wonder on the kid's faces as they approach the school. If you were going to change it I think using a less foreboding theme would have been best. I thought the removal of Norbert was an interesting choice. I’ve never even thought of removing that scene, but it works really well. There were also a few narrative decisions that didn’t quite work. The last act suffers a bit from the removals that were made. Removing the scene of Hagrid telling them how to get past Fluffy makes the pace moves a bit to fast and makes the trio look like complete idiots for trying to get past Fluffy with no idea how to do so, but the removal of Norbert, as well as the fact that Hagrid’s hut is in a different location from later films, necessitates this. Also, the flashback was used a bit too often. The only other complaint I have is really minor and doesn’t affect my rating at all but I just thought I’d mention it. I wish you had used the Philosopher’s Stone edit instead of Sorcerer’s Stone but again that’s more of a personal preference than anything else. I still prefer the extended cut of the original movie, and this is mostly because a few important scenes for both the pacing and narrative structure were removed, making the film feel a bit too fast. That being said I’d still give this edit an 8/10 and would highly recommend it to anyone who’d like a different take on the film. I can’t wait to watch Chamber of Secrets Revisited and take a look at both Goblet of Fire and Order of the Phoenix Revisited. HP and the Sorcerer's Stone: Revisited has to be one of the best fanedits I've ever come across, and that's how I discovered the man behind the magic, Andreas! The visual editing is seamless, the A/V quality is spot on, the reworked narrative is solid, and the new score fits the scenes like a glove! Plus, the new colour grade is a step up from the oversaturated pinkishness of the theatrical cut. Now admittedly, some of John Williams' original score is still somewhat present under the newly selected tracks, but all in all, this is a very minor complaint. If you Potterheads are looking for a more mature take on the Columbus era of the Harry Potter films, this fanedit is for you! I loved the new pacing and taking away from the more childish aspect of the original. Some of my favorite things - Draco is more of just an annoying bully side character rather than an over the top, crazy obnoxious evil kid. Much more realistic for the movie and it felt like the kids were all more like kids rather than caricatures. I love the changed ending with the whole point system taken out. Also thought the emotional flashback was well done for the ending. The music flowed so well and I instantly felt like I was watching a much better movie, even when I didn't know why. A couple things I thought could be better. I wish the flashback wasn't played so many times. I don't remember how many times it popped up but it was one or two many times. I also thought that Snape's potions class could have been left in. I haven't watched the original in a long time so I don't know if it was removed because of narrative inconsistencies or not. But I missed seeing more of Snape on screen. A small thing was the first song that gets played on the credits. I don't think it fit in at all. I wish it would've just gone to the Harry Potter music rather than that song. Overall I loved the edit and will continue watching this version! Looking forward to watching the other Harry Potter edits from Andreas. Finally got around to seeing this, and what a treat! Much darker indeed but also much more enjoyable than the original. And the audio is flawless... like how?!?! Andreas has put a lot of love into this, and his edits are great. The re-coloration is excellent, and he's truly achieved his goal of aligning the tone of the film with later entries in the series. If you want a darker, more mature version of this film, look no further. That said, I must say the original carried a family friendly charm which was in line with the tone of the book, and suited the film as well. So at least for me, I'm not sure this edit can replace the original, but rather stands as a great alternative way to experience the story. Technically it holds up well. Audio editing in particular is impressive, seamlessly integrating new pieces from later films which add more appropriate tension or emotion to scenes. In a couple cases however the track choices felt a little jarring, due to their intensity. The boat scene for instance, one of Ron's lines was overpowered by the new track. Andreas has also updated the sequence where Harry's parents are murdered, and uses this well several times throughout the film. The new prologue is cool, and Harry's nightmare is an excellent touch. I felt this sequence was used one or two many times too often however. And its final appearance during the conversation between Harry and Dumbledore felt shoehorned and the transitions sloppy, which made for a unique instance of an edit which I felt just didn't work. I appreciated the streamlined run-time, but felt cutting the potions class diminished Snape's character, and cutting Norbert led to an abrupt transition between the Forest scene, and the trio rushing to ask to speak with Dumbledore. Overall though, well worth watching. Looking forward to watching Andreas' other edits in the series.